Empathize This publishes comics illustrating true stories of prejudice and hardship. The design creates a welcoming, warm and safe space for readers. It is approachable, human and serious without being dark. Goals for the project include boosting the site’s credibility and traffic, increasing donations to help support new stories, and making it easier to find and read content. Social sharing tools have been given a boost to their visibility and functionality — most traffic arrives via social media so sharing is vital. 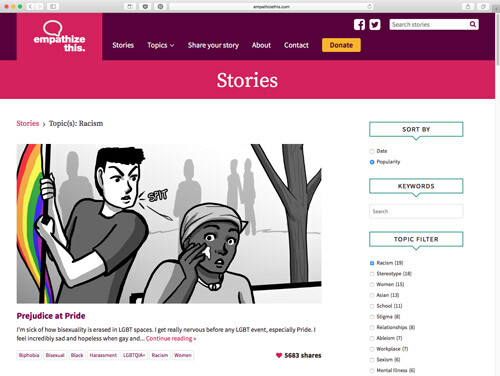 It was also important to make the call to action to share stories more visible and welcoming. The first story published after the new site went live accumulated several hundred shares (combined Facebook and Twitter numbers) within a few days. 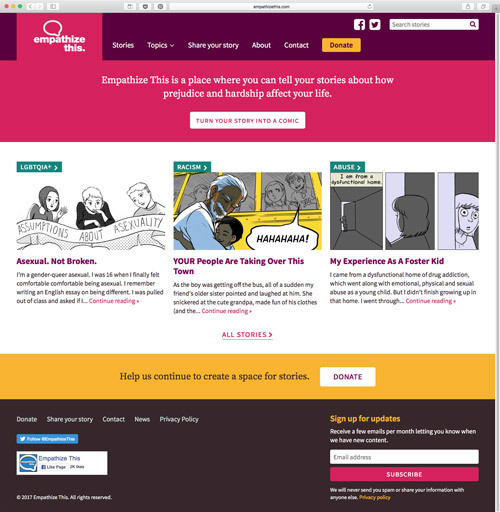 Considerations with this project included how the welcoming colours are applied to content — being careful to use more neutral colours for titles, for example; accessibility of content for colourblind and visually impaired readers; careful consideration of mobile usability as the site’s readers are predominantly viewing on mobile devices; image optimization for complex, large images being viewed at various scales. And as always, the backend site management was made smooth and intuitive.